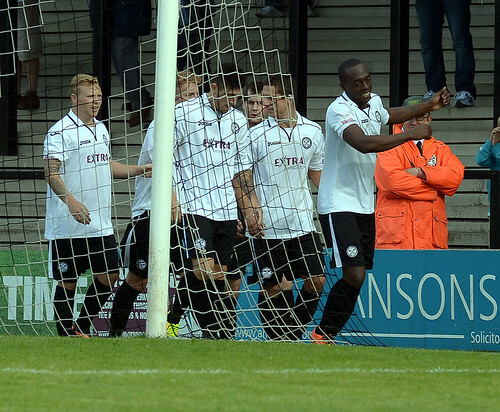 Five games into the Skrill North season and Hednesford Town proudly sit at the top of the table following their fourth victory of the campaign and their third successive one at Keys Park, writes Scott Smith. 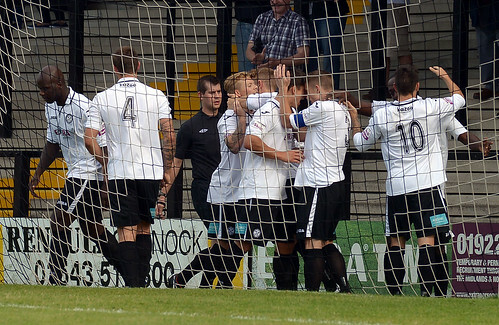 Supporters of The Pitmen couldn’t really have dreamt of a start to the season like this and although it is early days a 3-1 victory over a Barrow AFC side that were in the Conference Premier last season will certainly raise hopes of the good form continuing well into September. After a fairly even start Barrow had a good chance to take the lead in the 9th minute. Francino Francis kneed the ball back to goalkeeper Dan Crane however this was deemed as a back-pass by the referee and the away side were awarded a free kick five yards from goal. However they were unable to take full advantage with the ball eventually being blasted into the side netting. Town were able to edge ahead in the 15th minute when Elliott Durrell was brought down in the penalty area by Robbie Williams. The midfielder dusted himself down and coolly converted his third penalty of the season. Three minutes later it was 2-0. After good link-up play on the touchline Jamey Osborne’s ball into the box was deflected into the path of Dave Macpherson who slid the ball home underneath the advancing Tony McMillan in the Barrow goal. This brought the Cumbrian side to life and they almost found a way back into the game in the 21st minute only for Durrell to clear a downward header off the line. Three minutes later they reduced the arrears though when Dale Johnson headed home at the second attempt after his first effort had struck the upright. Both sides continued to attack at pace and with chances arriving at both ends. First Neil Harvey headed wide at the back post for Town before the lively Greg Mills dragged an effort past the post right on the stroke of half-time for the Bluebirds. It was to be the visitors that would start the second half the stronger as they tried to find an equaliser, however The Pitmen were to make it 3-1 in the 58th minute. A ball into the box was flicked on by Wayne Riley and Harvey was on hand with a sweet left-footed finish into the net for his first goal of the season. This really seemed to knock the stuffing out of Barrow who failed to make hardly any clear-cut chances on the Hednesford goal in the final half hour, despite having plenty of possession. The home side meanwhile saw Harvey blaze an effort over the bar whilst substitute Aaron Rey had a shot expertly tipped onto the post by McMillan. In the end though the 58th minute effort would be the last goal of the game as Hednesford saw out time to record another impressive victory over a side that just a few months ago sat some two divisions above them. The Pitmen now have a week’s break from action after a hectic opening to the new campaign, with their next fixture seeing them travel to North Ferriby United on Saturday 7th September, 3.00pm kick off.